1 of 2 Combine vinaigrette and garlic; let sit for 15 minutes. Cut eggplant into 10 slices, each about 1/4-inch thick. Place in resealable bag; add 2 tablespoons of the vinaigrette. Set aside. Cut mozzarella into 10 slices, each about 1/4-inch thick. Top with 1/4 cup of the vinaigrette, and toss gently. Set aside. Brush chicken with remaining vinaigrette; cover and refrigerate for at least 1 hour. 2 of 2 Finely chop tomatoes; stir into mayonnaise. Cover; refrigerate at least 1 hour. Cut drained peppers into strips; set aside. 1 of 1 Heat panini maker according to manufacturers instructions. Cook chicken and eggplant 5 minutes per batch. Wipe panini maker clean with paper towels. 1 of 2 Trim 1 inch off ends of each baguette and cut each in half lengthwise. Spread each baguette with 6 tablespoons mayonnaise. Restack and slice each into 5 pieces (for a total of 10 pieces). 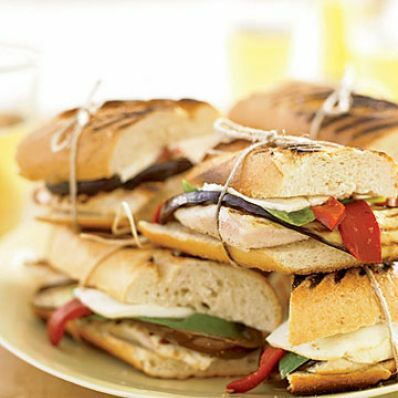 Divide chicken, eggplant, basil, peppers and mozzarella evenly among the 10 panini, trimming chicken as needed. Gently press sandwiches to compress slightly. 2 of 2 Cook panini 5 minutes per batch until grill marks form and cheese melts.